Anyone who has been to Market Day in downtown Newnan knows that there are a lot of talented artists within the borders of Coweta County. Our new “Handcrafted in Coweta” segment will feature local artists, their work and process. We were first introduced to the weaving skills of Ann Lynn Whiteside at the Return From Ayr event when they displayed the gorgeous Georgia tartans she wove for the trip to Scotland. We immediately fell in love with her adorable studio, which is nestled in a peaceful forest in a beautiful area of Newnan. The cute little workshop is surrounded by tall hardwood trees. Sometimes the nature comes inside for a visit. This cute little guy startled us by appearing out of nowhere on one of the looms. Her artistic background is evident as soon as you enter her workshop. The cabinets are painted with hand-lettered script detailing their contents, and there are several gracefully sculpted pottery pieces. Ann Lynn Whiteside was originally a career art and Latin teacher. She also made and sold her own pottery. The art of weaving caught her attention and held a fascination for her. She describes it as a passion that came from her heart. She plunged right into the learning process by ordering a book and a tabletop loom and teaching herself the basics. We were left in no doubt of her passion for the art. She was enthusiastic and engaging as she described to us the process of weaving fabric from start to finish. Her teaching roots were evident in her vivid, coherent descriptions. She described the highly technical aspects of weaving in a way that made them very easy to understand. After her first few self taught attempts at weaving, which she describes as rough and uneven like hobbit clothes, Whiteside decided to take classes. She honed her skills in weekly classes, enjoying the camaraderie as much as the weaving. When the school at which she taught was forced to close due to the economic recession, her husband suggested she pursue her weaving passion as a full time job. Today, she turns out several beautiful pieces a year that can be purchased at any one of the craft shows she attends. She makes towels, shawls, hats, blankets, rugs, scarves and vests. We loved the all the garments she showed us. They are vibrantly woven, textured items with an unstructured free flowing charm. She also makes highly technical, tightly woven pieces that are deceptively simple in appearance. In 2014, she was commissioned to weave over eighty tartans. These are intricate time consuming wearable works of art. 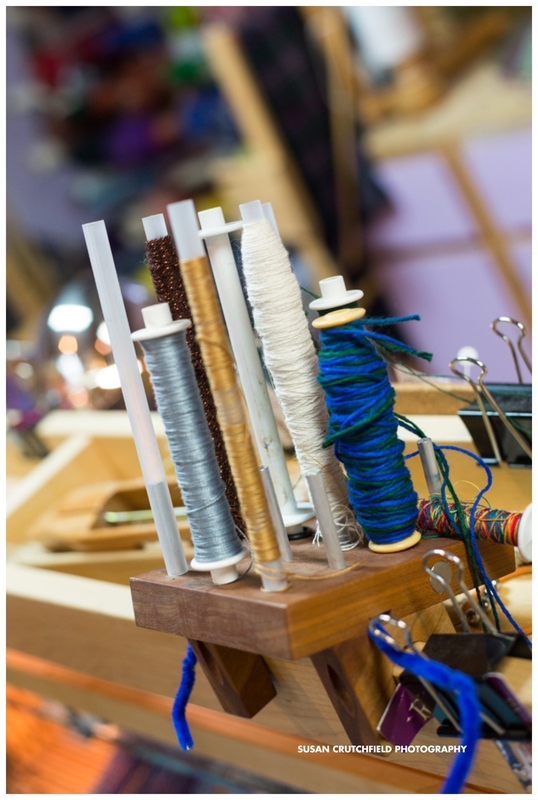 Most of the floor space in her workshop is taken up with looms. We were introduced to April, a gorgeous antique loom made in Springfield, Ohio in 1920. This loom is a wonderfully crafted work of art in itself. Many of the looms crowding the floor are student looms. Whiteside teaches classes three times a week to all skill levels. 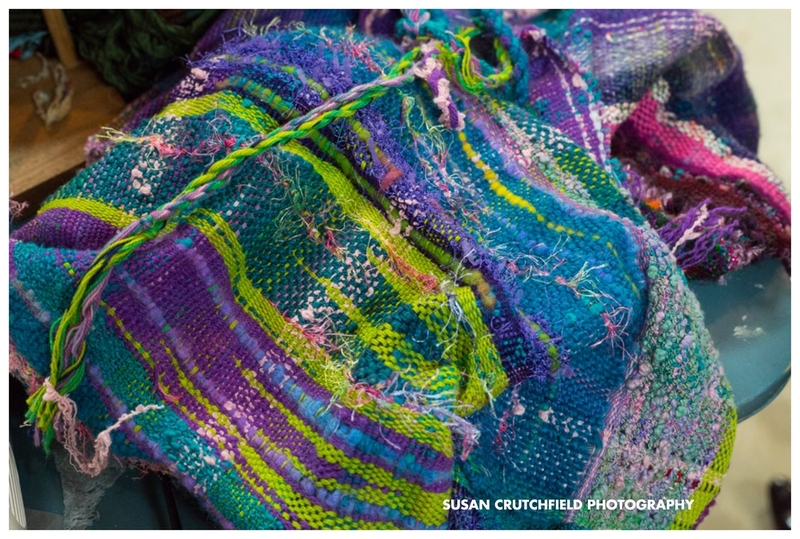 She began to teach weaving to the students in her art class when her school was still open. She described to us a curriculum she taught over the course of a semester called “From Sheep to Shawl”. In this class, students learned to weave fabric by taking a trip to a farm where they sheared goats. They took the wool back to class where they learned how to card, comb and spin it into yarn for weaving. They then wove the yarn on homemade looms. We thought this sounded like an amazing class and something we would love to do! Whiteside believes it is important to know where fabric comes from and the history of how fabric was traditionally made in the United States. In addition to teaching classes in her studio in the woods, Ann Lynn Whiteside volunteers to teach classes to the economically disadvantaged and developmentally disabled on a weekly basis. She also donates half the proceeds of her yearly craft show, The Artists Market at St. Phillips Cathedral to the Emmaus House and The Holy Comforter Church arts program. Ann Lynn Whiteside can be found doing weaving demonstrations (and according to her talking in a funny voice) during the yearly renaissance festival. She teaches classes Tuesday, Wednesday and Sunday and has open spaces available for new students. Her next show will be at The Artists Market in Atlanta beginning on November 20th. Stop by to view her beautiful work in person and purchase a unique Christmas gift. She is also at Market Day the first Saturday of every month on the square in downtown Newnan. Contact Ann Lynn Whiteside to learn about enrolling in a class, commissioning a product or purchasing an item.